King Charles the Martyr Church has been an established landmark in Royal Tunbridge Wells for over three centuries. Its origins are entwined with historic Chalybeate Spring and the foundation of the Pantiles, the town’s elegant shopping parade. Today we welcome visitors from all over the world to our beautiful church, right in the heart of town life. At the right is a porch leading into the 1684 chapel, and at the left is one of the two doors into the extended building of 1696. This church began as the first permanent building in Tunbridge Wells. Before 1676 there was no village here, nor any name on a map. Summer visitors had for many years sought benefit from drinking the chalybeate waters, but there were no lodging places closer than Rusthall or Southborough, both more than a mile away. Thomas Neale, entrepreneur and London builder, saw the commercial possibilities of the place. 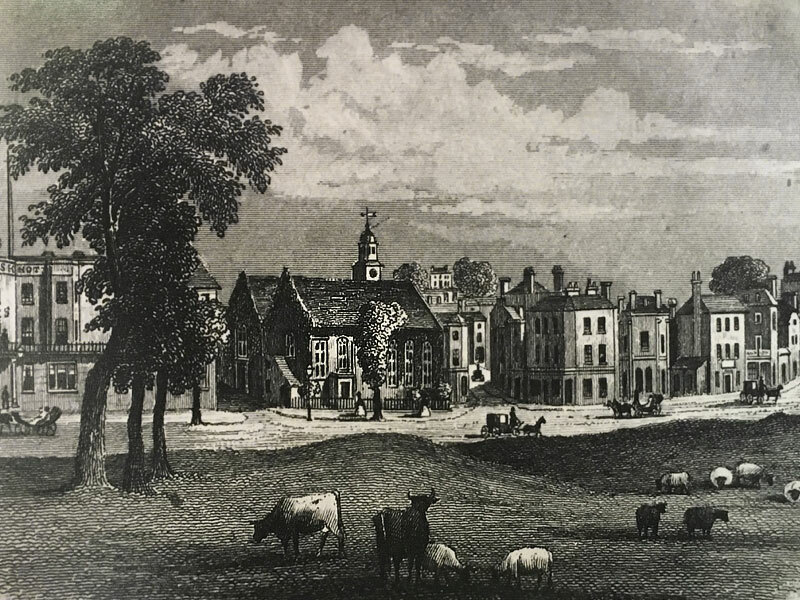 He purchased the site of the springs and the area now called the Pantiles, and assisted with a scheme to design and build a chapel which, beyond its devotional function, would serve additionally as an assembly room or temporary shelter from inclement weather. A covered exterior stairway up to the north gallery can be seen under the tree on the left. On entering from the street you might have noticed that the arrangement of the church seems not to agree with the orientation of the plasterwork ceiling. This arises from past alterations to the main axis of the building. The original chapel occupied that part of the present church between the font and the organ case. The window by the font fills the original doorway. None of the present-day arrangement in the chancel area was part of the first chapel. Stand with your back to the font, and in the ceiling see a symmetrical pattern of five round domes exquisitely decorated by John Wetherell, a plasterer who had worked for Christopher Wren at Greenwich. Slaked-lime plaster was used for ceilings of this kind, the men standing on scaffolds, and working from tables. Beyond the five domes is a larger octagonal one with a date, 1682, moulded in the plaster. The first altar, painted and on a pedestal, stood under this octagon dome. The galleries were put in later. 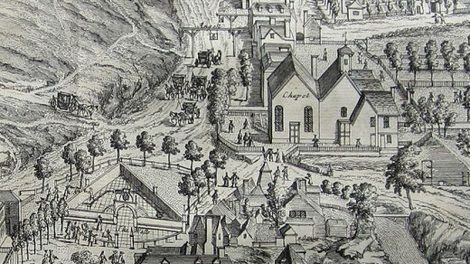 By 1688, rising popularity of the resort, and consequent overcrowding in the chapel, made enlargement necessary. The original west wall was taken down (where the two central pillars now stand), and an extension made that virtually duplicated the first building, making the enlarged interior nearly square in plan, as now. 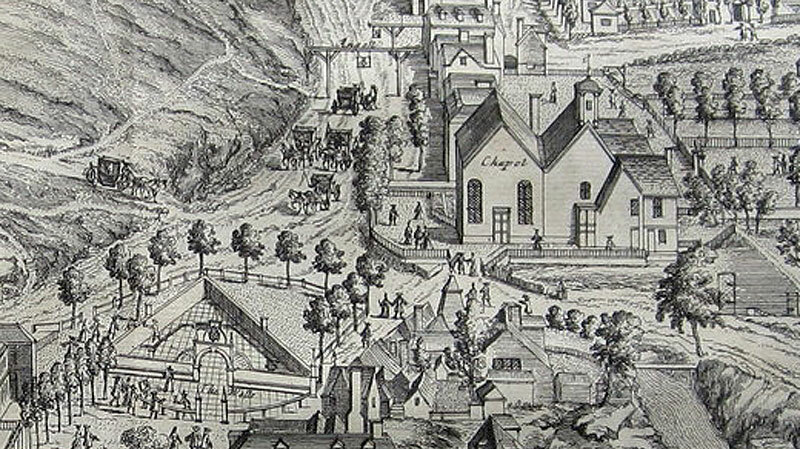 Two more entrances were made at this time, one of which can be seen in Kip’s engraving. 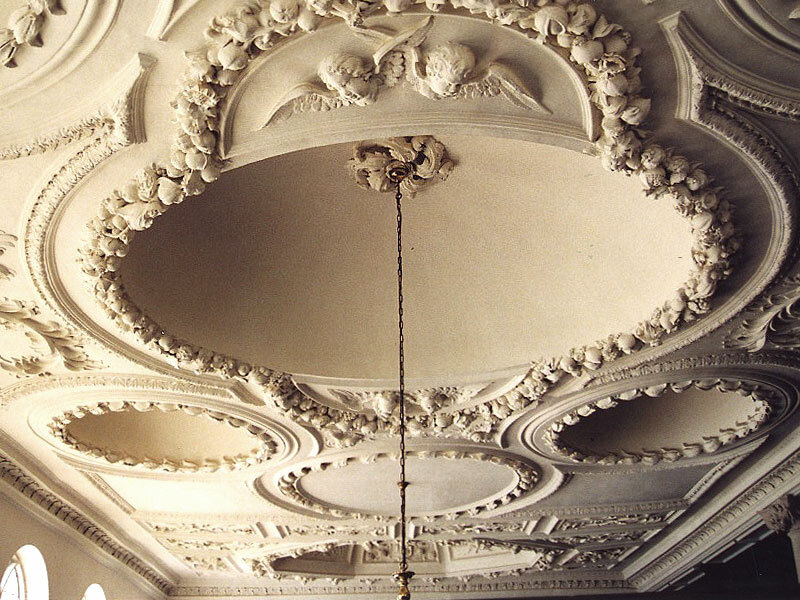 Henry Doogood, most celebrated of Wren’s plasterers, created the magnificent second ceiling, dated 1690 in its octagonal dome. His work was so consummately excellent that it can be counted as a major achievement in 17th-century European art. Panelled galleries on three sides of the chapel were mainly for servants and trades people, and could be reached only from outside, effectively separating the social strata in church as well as out of it. Outside stairways are visible in Kip’s engraving (above), and Dodd’s lithograph (right). Photo of the three-decker pulpit as it would have appeared during Princess Victoria's visit in 1835. This view is looking towards the west wall which today is the back of the church. Stand by the foot of the stairs leading up to South Gallery, and imagine yourself attending Sunday morning service in the summer of 1835. Looking across to the North Gallery opposite you might have seen Princess Victoria, then a girl of sixteen, seated with her mother, presumably screened off from the remainder of the gallery. A large brass plaque now attached to the panelling commemorates her visits. 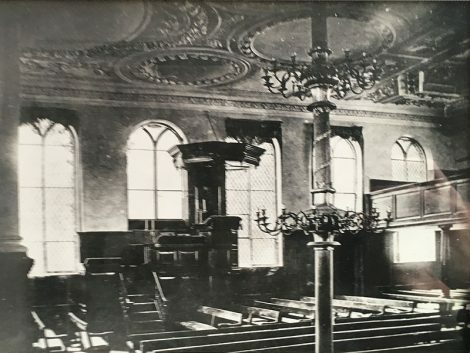 Victoria’s seat was not at the back, as the present orientation of the church suggests, but at the front, overlooking the preacher in a big three-decker pulpit that formerly stood against the west wall. There were also at this time special seating arrangements in the Nave. Gentlemen occupied ‘1 the central benches, facing west toward the pulpit, their backs to the Communion table, and the lady worshippers sat at the sides, facing inwardly’. 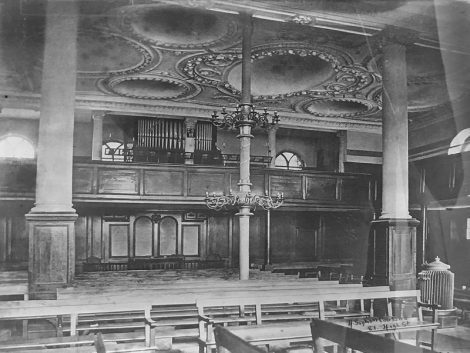 19th-century photo of the church prior to the re-ordering of 1882; the organ loft seen here is has been removed and this area is now the sanctuary and altar. The chapel became a Parish Church in 1889, with reversed orientation. 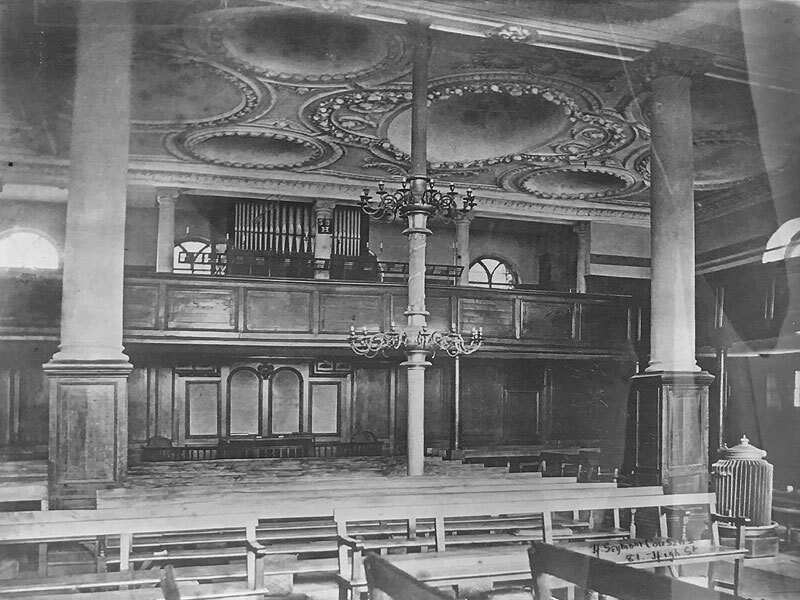 At the chancel step, as now placed, you would in 1880 have been standing under the organ-gallery. A few feet away against the side wall of the chapel stood the Communion table, behind the worshippers and half hidden in a windowless space under the gallery. Structural alterations began by removing the gallery, and cutting through the chapel wall to form a chancel arch. The old schoolroom behind gave way to a Sanctuary, furnished with Credo and Paternoster boards brought from the newly- demolished Wren church of All Hallows, in the City. Seating in the Nave was turned about to face the new Sanctuary, and the old three-decker pulpit was taken away. After long delays, a minute parish of sixty-seven acres, much of it open common-land, was agreed.